Western societies like that of the Netherlands are changing rapidly. Current economical, demographical and political trends move away from the traditional welfare state towards a type of society not yet fully cristalized. Two terms are often named within this context: the participatory society and Smart Society. Much remains unclear about these 'new' types of societies. For one, they are worlds apart so it seems. The first stresses the responsibilty and influence of citizens, returning to a more bottom-up and fine-grained social network. Smart Society is more focused on technological solutions led by the wide adoption of smart phones, social networks and high tech infrastructure. As part of the programme by The New Institute these unclear territories of the future society were explored and mapped out. 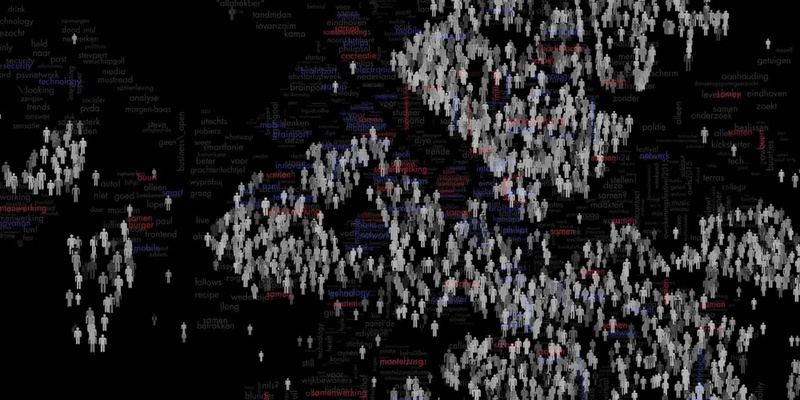 Who are using the words surrounding the participatory and smart society. What are the grassroots projects of citizens and what problems are they tackling? How are online platforms responsible for local initiatives? How do the technology driven projects surrounding security and infrastructure actually turn out serving society and at what costs? By mapping out what is known, the unknowns also become apparent. In this way The State of Eindhoven is both actively sketching out and supporting the possible societies to come.